Nottinghamshire construction company Robert Woodhead is celebrating the long service of dedicated site manager Don Wilson, who has just marked 50 years employment with the business. Don joined Robert Woodhead Ltd in 1965 as a joinery apprentice straight from school and 50 years later, still has no plans to retire. Don said: “I was good at woodwork when I was at school so it was an obvious choice for me to look for a job that used those skills. I went to talk to Robert Woodhead to ask about the possibility of a joinery apprenticeship. I think he was hoping he could steer me towards bricklaying as they were expanding the construction site of the business but I was set on joinery and was lucky enough to be able to convince him that I was worth employing. When Don joined Woodhead, the company was only years old and there were just 12 employees. Day to day life on site was very different to modern construction practices. Today Woodhead employs over 100 people and delivers projects in sectors including social housing, commercial projects, education, heritage and leisure. Don continued: “Not long after David Woodhead took over the business following the death of his father in 1979, he offered me a promotion to site manager. Over the years the role has changed to accommodate new guidelines and regulations within the industry and there is definitely a lot more paper work now than there was when I first started as site manager. 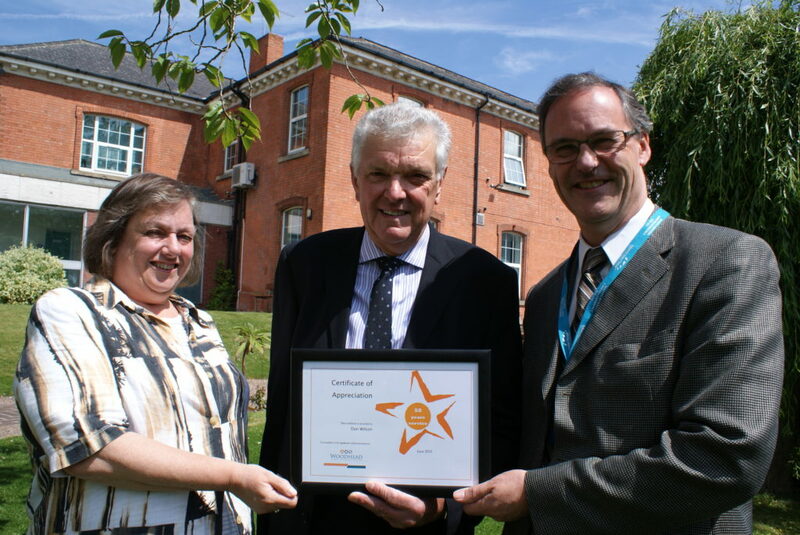 Don (Pictured Centre) was presented with a long service award to commemorate his 50 years by Managing Director David Woodhead and Finance Director Hilary Cheshire.